Under the direction of Sir Walter Parratt, Organist at St George’s Chapel from 1882 to 1942, choristers were expected to work hard to produce the exacting standard of music expected of them in the Chapel. However, even in the Victorian period, they were allowed the occasional lighter diversion. We know, from a programme recently donated to the St George’s Chapel Archives and Chapter Library, that in the early 1890s the choristers took part in a musical burlesque performed in The Cloisters, Windsor Castle. 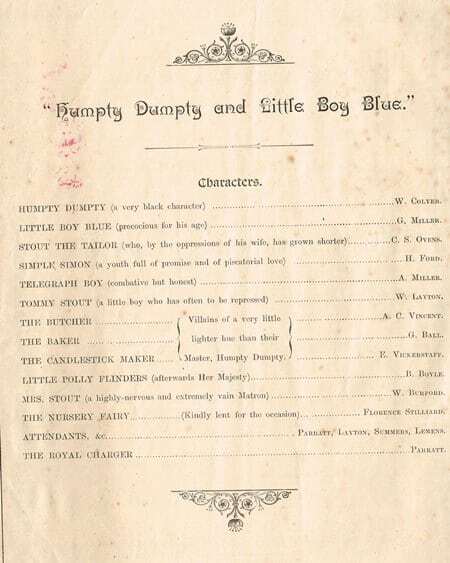 Entitled ‘Humpty Dumpty & Little Boy Blue’, it was based on a ‘A Nursery Pastoral’ by Alfred Paxton, adapted for the Windsor choristers with music composed by R F Coules F.C.O., Organist of St Mark’s Church, Worsley. With the choristers taking the leading parts, both male and female, the cast was completed by the guest appearance of Florence Stilliard, daughter of Lay Clerk Joseph Stilliard, as ‘the Nursery Fairy’ and of Parratt himself, who seems to have entered into the spirit of the occasion with his own role as ‘the Royal Charger’. Martin Akerman, Sir Walter Parratt’s assistant organist, provided the ‘Selections between the Acts’. Divided into three Acts, the musical burlesque tells the story of the romance between Boy Blue (described in the cast list as ‘precocious for his age’) and Polly Flinders, who somewhat surprisingly becomes Queen during the course of Act I. Despite the dastardly efforts of the villainous Humpty Dumpty (‘a very black character’) and his wicked henchmen, the butcher, the baker and the candlestick maker, to break up the young couple, all ends happily as Boy Blue receives (and presumably accepts) a proposal from Queen Polly whilst Humpty Dumpty, acknowledging his defeat, is granted a royal pardon. Other characters include Simple Simon and Tommy Stout, their parents Stout the Tailor (‘who by the oppressions of his wife has grown shorter’) and Mrs Stout (‘a highly-nervous and extremely vain Matron’) and the telegraph boy (‘combative but honest’). Songs include ‘Simple Simon went a-fishing’, ‘You say you adore me’, ‘They say I am a Naughty Boy’ and ‘It’s Going to Rain’. The programme is undated but we can assume that the performance took place sometime between April 1891 and January 1893 since W. Layton (who played Tommy Stout) was a chorister from April 1891 to 1896 and W. Colyer (who played Humpty Dumpty) was a chorister from November 1889 to January 1893. Burlesque, defined in the Merriam- Webster online dictionary as ‘theatrical entertainment of a broadly humorous often earthy character consisting of comic skits and short turns’, was very popular at this time, both in Europe and North America. Deriving its name from the Spanish word ‘burla’, meaning joke, traditional burlesque made use of satire, exaggeration and parody and may be found in literature as well as drama. By the eighteenth century, the word was used to describe often risqué parodies of serious operas or plays. In more recent times, burlesque has become associated with dancing, variety shows and striptease. 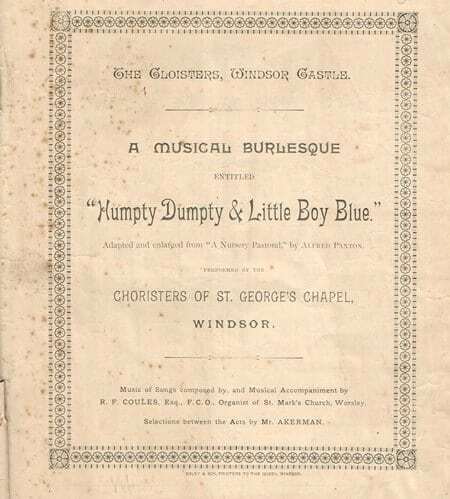 However, judging by the programme, the musical burlesque performed by the choristers of St George’s Chapel in the 1890s represented the more traditional innocent genre.